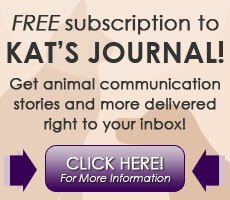 Animal Communication & Holistic Animal Care Workshops | Katalyst for Animal Wholeness, Inc.
Workshops. I am currently taking a hiatus from teaching workshops worldwide. However, I welcome inquiries as to future workshops, whether you wish to attend one or would like to host one in your area. Kat’s Journal. This is my free bi-monthly newsletter which I welcome you to sign up for in the navigation pane to the left. Topics include animal communication stories, what the animals teach us, information regarding holistic care, spirituality and more.